This entry was tagged 1 Corinthians 12, 1 Corinthians 14, charismatic, continuationism, gifts of the Spirit, glossolalia, Holy Spirit, pneumatology, spiritual gifts, tongues. Bookmark the permalink. Isa 28:11 ‘strange tongue’ is parallel to and synonymous with the next word ‘foreign tongue’. It should be translated as ‘alien language’ and ‘foreign language’. It’s not ecstatic tongue or babbling-tongue. A sign to the unbelievers? A sign for what? A sign that how nice it is to see these people babbling – how ‘good and beautiful’ is tongue-babbling? That they themselves can do it, if they practice and they listen to the instruction how to do (No, no instruction is needed; it’s mass hypnosis). It’s unfruitful to dwell on a few verses to get support for one’s position; this is a sad practice by both orthodox and many cults. Get the big picture. Read 1Co ch. 12-13 in continuity and 1Co in entirety. Show me whether Jesus Himself did tongue-babbling and said how nice it could be. Do not follow the practice of the wayward Corinthians over them Paul poured his heart over. First off, you have left a lot of comments on this blog and my other one on continuationism. I am happy to engage in dialogue, but I must ask you to engage with grace, in an irenic manner. If you are not willing to do so, then I will have to block your comments. Remember, we are both followers of Christ, in the same family. Let’s grow together in grace. 1) I am ok to translate glossolalia as language rather than tongue. The two words communicate the same idea. 2) Other tongues/languages does not have to be about mass hypnosis. This was an actual gift of God, and if used properly, it can be edifying to the body of Christ. That is the testimony we see in Acts and in 1 Corinthians 12-14. 3) There is not a lot of teaching on tongues in the Bible. But what we do have, we must respect. So we have to engage with Acts and 1 Corinthians 12-14. From what we read in the Scripture, Jesus did not speak in tongues. 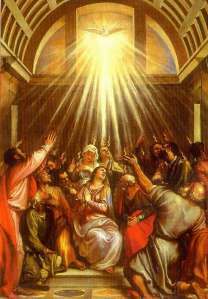 But such a gift was not given until Pentecost as Jesus poured out the Holy Spirit. And when Paul instructed the Corinthian church, remember he said it was a gift of the Spirit. We need God’s good gifts.